Chi’s Sweet Home is not a masterpiece of manga. It will not blow you away with its brilliance and depth. It is, quite simply, cute. Utterly and irredeemably cute. Chi is a small grey tabby kitten who gets lost after she becomes distracted while out for a walk with her mother. She ends up crying on the grass of a neighborhood park, where she comes face to face with a small boy named Yōhei, who has also gotten lost. After Yōhei’s mother finds him, the pair takes the exhausted kitten home. Chi gradually gets used to her new home with the Yamada family, but she still misses her mother. The Yamada family gradually gets used to life with Chi, but their apartment complex doesn’t allow its residents to keep pets. Each short, eight-page chapter of the manga focuses on one small episode in the life of Chi and the Yamada family. Chi goes for a walk. Chi goes to the vet. Chi learns that she loves milk. Chi learns how to use the litterbox. Chi climbs the stairs. Chi climbs the window curtains. And so on. These mini-adventures are tied together by the central conflicts of the series, which span several volumes at a time and are developed and resolved in surprising yet satisfying ways. The characters, especially Chi and Yōhei, also develop slowly as they gradually grow older. Chi’s Sweet Home belongs to a genre that I will call “pet manga.” Some of these manga, such as Shirakawa Kikuno’s Momokan, are obviously targeted at children. 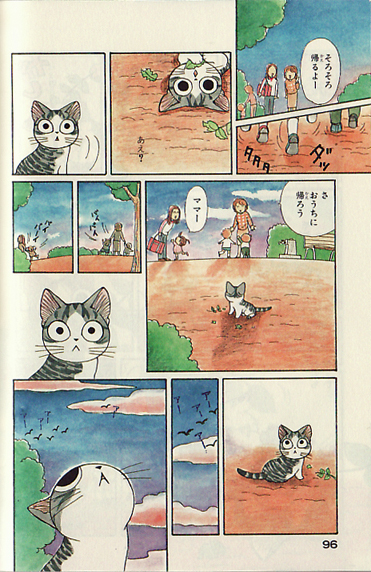 Others, such as Konami Kanata’s earlier manga about an old Japanese woman and her old Japanese cat, Fuku-fuku Funyan, and Iwamichi Sakura’s housewife comedy Shiawase neko gohan, are aimed mainly towards adults. Chi’s Sweet Home at first seems to be a children’s manga, with its simple vocabulary and character designs, but it doesn’t strike the reader (at least not this reader) as childish. It’s just unbearably cute. I don’t mean that it’s precious or affected – Chi is unartfully heart-stoppingly adorable. Within this genre, Konami’s manga seems to have performed fairly well. The chapters of Chi’s Sweet Home have been serialized in Kōdansha’s Weekly Morning magazine, a popular manga periodical aimed at adults (or at least older young adults) and featuring manga that either make an attempt at realism or explore historical fantasies (like Nakamura Hikaru’s popular Sei onii-san, or “Saint Young Men,” which has Jesus and Shakyamuni Buddha living together in a flat in Tokyo). 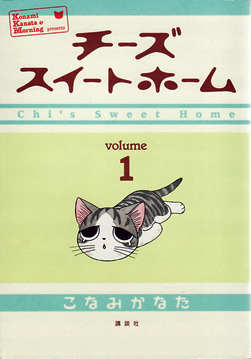 Chi’s Sweet Home picture books and calendars can be found in bookstores alongside the manga, and, in 2008, an animated version produced by Studio Madhouse began airing on TV Tokyo. What makes Chi’s Sweet Home stand out? (Besides the ridiculous cuteness?) It might be that each volume of the manga is published in full color. It might be the text of the manga, which invents onomatopoeia at will and gives Chi a highly distinctive voice. It might also be that Konami manages to construct an effortlessly believable world that the reader feels as if he or she could easily enter. This world building is strengthened by the extras that are included in the back of each volume, such as apartment floor plans and neighborhood maps. Other extras include interviews with Konami and the step-by-step process that the manga artist undergoes in the creation of each chapter. Overall, Chi’s Sweet Home is a beautifully drawn, beautifully written, and beautifully published manga. And did I mention how cute it is? Vertical Press has picked up the American license of the property and will begin releasing it in English translation in June of this summer. The original Japanese manga, however, should not pose a problem to anyone with a semester or two of language training. I feel that each individual episode is so well-crafted that even someone with no Japanese background will be able to understand and appreciate the story. What I really love about Chi is how the mangaka succeeds at making Chi seem like a real kitten. Facial expressions, behavior, monologue (dialogue?) … a real kitten with personality. She looks and acts and speaks just like the personality we ascribe onto our pets, i.e. like a real kitten, or our imagination of how a real kitten thinks and acts. In this way, she’s totally different from Garfield, who seems more human, more a cartoon character than a real cat. Thanks much for introducing this series to me! I had this period during my first year of grad school when I decided that I was very serious business and therefore too busy and important to read manga. When I got to Yokohama, one of the first things I did was to go into Yūrindō to buy a copy of Dazai Osamu’s Shayō (or something equally ridiculous) – and then I saw a big display of Chi’s Sweet Home. I left the store with both books; but, needless to say, I only ended up reading one…. NOOO You are appealing to my primal obsession with cute cats! I’ll look for it at Book Off. My partner has just started Japanese lessons–do you think he’d be able to understand this when he learns hiragana? It’s so hit or miss with children’s manga because sometimes they have difficult (for beginning students of Japanese) words in them (albeit in hiragana…). These are really beautifully published little manga. I was going to say that maybe you should consider buying them new (they’re only about 650 yen each), but then I remembered how nice the “used” books at Book Off always are. Ah, Japan…. I agree with you about how children’s books can be surprisingly difficult, but I think your partner shouldn’t have any trouble with this manga, especially if you help him. Chi speaks in a very distinctive way – I’m not going to call it a lisp, exactly, but it is a childish way of speaking. For example, she often pronounces the syllable “da” as “ra” – so something like もうちょっとだけ becomes もうちょっとらけ. Also, she seems to have trouble pronouncing the syllable “ru” when it ends a sentence, so おうちにかえる becomes おうちにかえう. Once you get used to her way of speaking, though, it’s not so bad. There seems to be a major section (often adjoining the photography section) of most Japanese bookstores that focuses on photo-heavy books about cute animals. I’m sure that you are aware of this – but, just in case you’re not, BE CAREFUL. Yeah, in that case, it’d be better to read it with him so he doesn’t end up sounding like a kitten. Hahahah. I’m not really into cute photo calendars or books of cats (other than I Can Has Cheezburger? 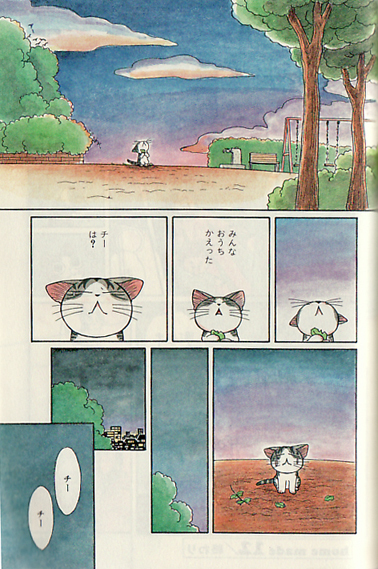 ), but manga cats seem to be my new thing. Curious. Also: Interestingly, some of the only manga I have bought new was Berusaiyu no Bara, but considering how much I love it, I wanted it to be “well loved” from MY love. You’re right, though–all of the used manga I own is “like new”–read once by an interested person and sold off immediately.